This cemetery is located on the west side of Government Way in the North 7300 block, it lays between Government Way and US HiWay 95, north of Coeur d'Alene, Kootenai County, Idaho. This cemetery was originally developed in the early 1950's as "Restlawn Memorial Park, Inc" per the Contract for Deed document's my parent's received when they purchased four plots in 1955. 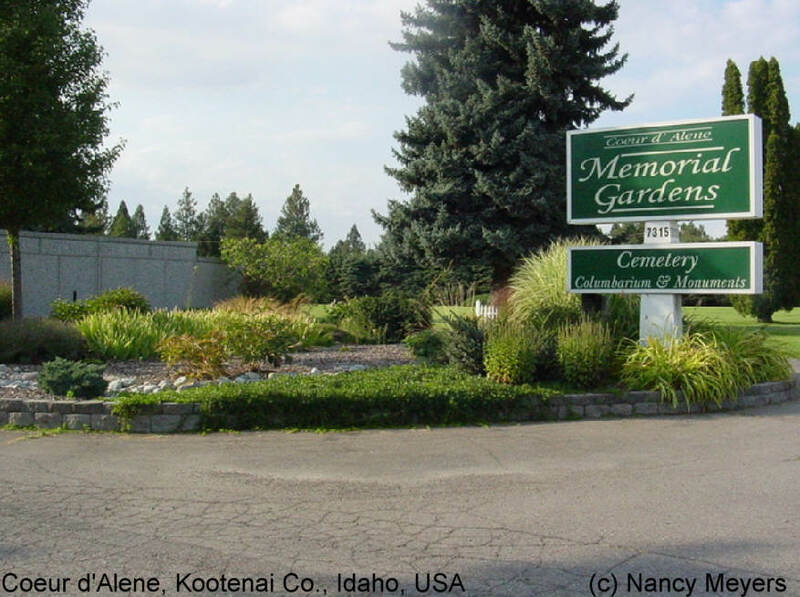 The cemetery name was changed to "Coeur d'Alene Memorial Gardens Cemetery, Columbarium & Monuments" some time later. Developers had plans to eventully expand the cemetery to the west. Some expantion has occured since the cemetery opened. The two photo,s posted are provided by my niece Kerry Hodge the daughter of Donald Kerry Walters my brother. It is permissible to use these photo's for your private family history tree's. They are already posted on Ancestry.com.